My task is to calculate current declination and right ascension for some artificial Earth satellite. For example ISS. I am using latest TLE data for extracting keplerian orbital elements and then calculate current cartesian orbital state vectors in ECI frame. From the position vector I directly calculate declination and right ascension, using cartesian to spherical coordinates conversion. Right ascension gets calculated correctly but I am having problems getting the same result for declination as the one displayed by satellite trackers. 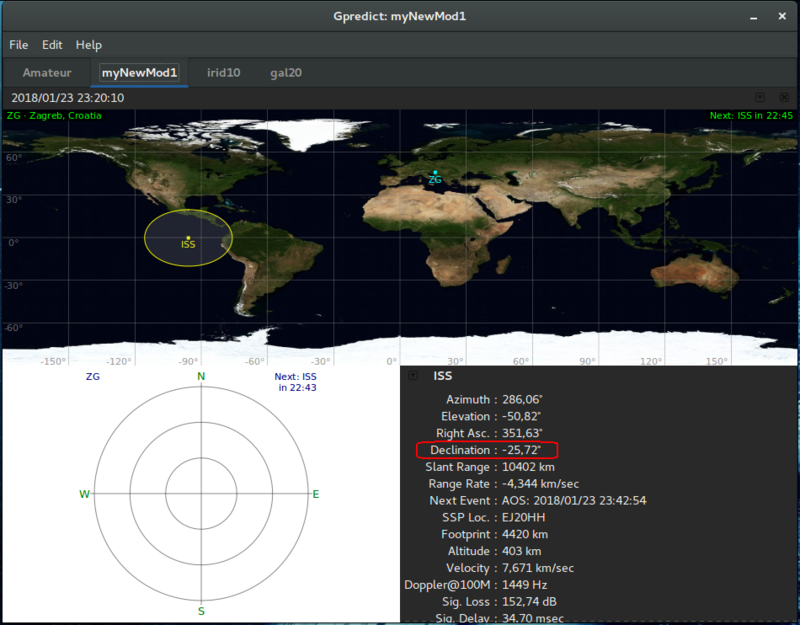 Speaking of satellite trackers, I don't understand how is their declination value even correct. Declination is an angle measured north or south of the celestial equator. Celestial equator of course is on the same plane as the equator of Earth. 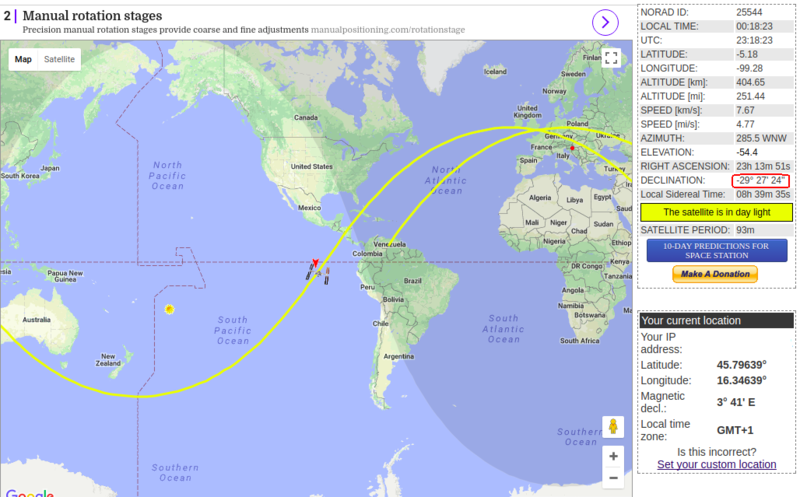 Then how is it possible that, when a satellite (ISS in this example) is almost directly above Earth's equator, satellite trackers calculate declination to be around -29° ? Shouldn't the declination angle be zero? My calculations for this "ISS above equator" example did give declination to be close to 0°. Who is doing the calculations wrong and why? Something which is very distant and lies on the celestial equator will have a declination of 0°, but if it is nearby then its declination will only be 0° to an observer located along Earth's equator. From your location in Zagreb, something like the ISS, even if it is crossing Earth's equator at a longitude of ~16° will appear to be in the southern sky, and your declination coordinate will likely be south of 0°. Not the answer you're looking for? Browse other questions tagged orbit satellite declination right-ascension or ask your own question. Measuring declination in negative hours of arc?